Mosser made many series of clowns in different colors. Each color is named and is imprinted on the top their hat. This one is Wilby, light blue irridized. Mint condition standing 3.5" tall. 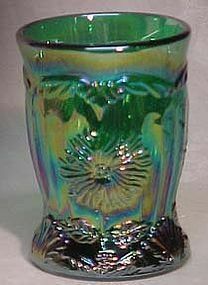 Mosser Green Irridized Dahlia Tumbler measures 4" tall. In mint condition. Sorry, but only one available. 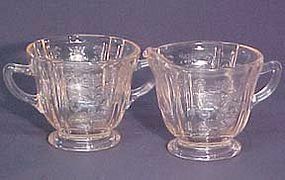 New Madrid (Recollections) Pink Sugar and Creamer by Federal Glass Company. Both in mint condition. 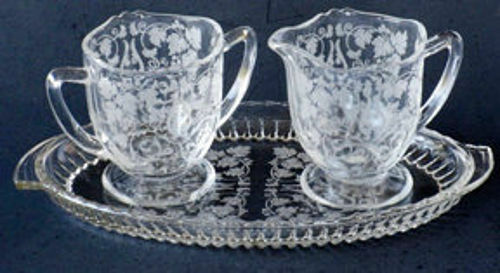 New Martinsville Creamer & Sugar with Tray, Florentine Etching on Radiance blank. 3-piece set in mint condition. New Martinsville Crowsfoot Cream Soup was made in the 1930's. 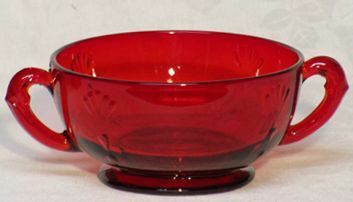 Two-handled bowl, 11 oz. and all in mint condition. 7 are available. 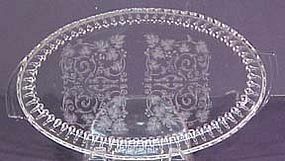 New Martinsville Florentine Tray 10"
New Martinsville 10" tray with Florentine etching on the Radiance blank. 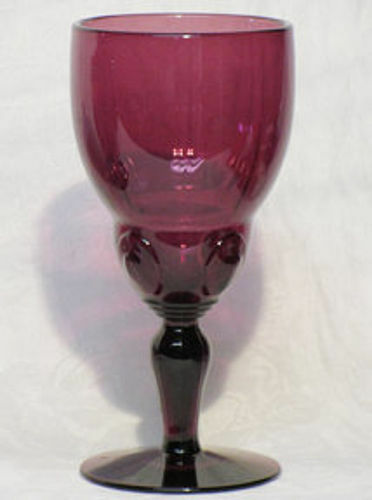 Made before 1941 and in excellent condition. Pattern #44/29 with deco handles. 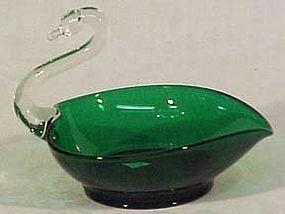 Oblong Green Swan celery dish was made by New Martinsville. It is 7" high x 11.5" long and is 4.75" wide. It is in excellent condition. 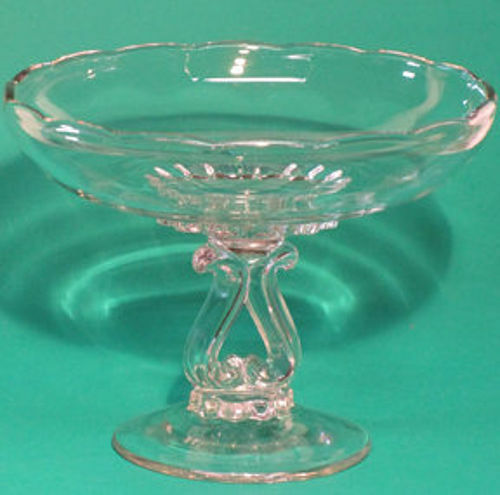 New Martinsville Lyre Compote in Crystal. stands 5.5" tall and is 7" across the top. In mint condition. 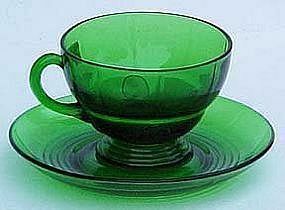 New Martinsville green Moondrops cup & saucer, all in excellent condition. Produced from 1932-40. Three are available. New Martinsville Moondrops Amethyst 9 oz. 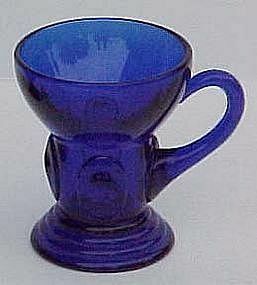 Water Goblet in mint condition. Made from 1932-40's. Eight are available, 6.4" tall. New Martinsville Moondrops Amethyst Creamer & Sugar, 7 oz. in mint condition. Made from 1932-40's, footed. This is the larger creamer and sugar. 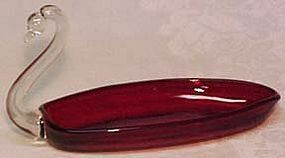 New Martinsville Moondrops Cobalt 2 oz. 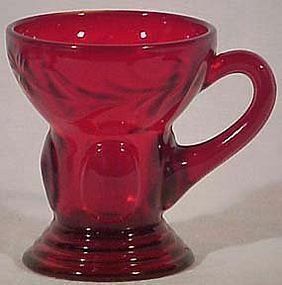 Whiskey (or handled shot) tumbler with handle. Tumbler is 2.75" tall. Only 1 available, in excellent condition. Produced from 1932-1940. 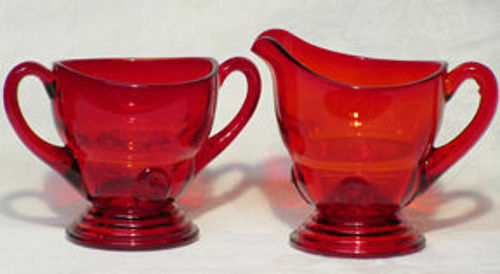 New Martinsville Moondrops Red Individual Creamer & Sugar, 3 oz. in mint condition. 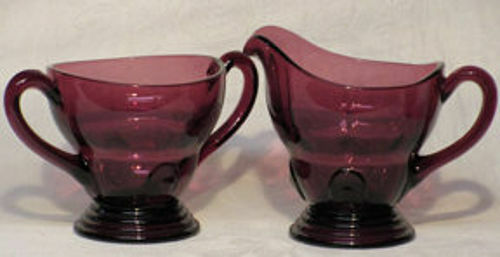 Made from 1932-40's, footed. 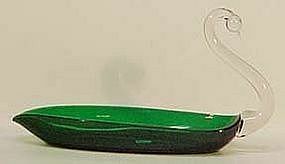 Moondrops was produced by New Martinsville Company from 1932 to 1940. Also notice that the "flower" pattern is pressed into these 3 whiskeys at the top rim. This is uncommon. All three of these 2 oz. whiskey/shot glasses are in mint condition. 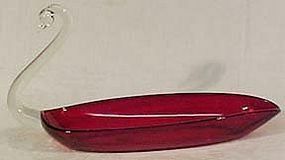 New Martinsville Red Oblong Swan 8"
New Martinsville / Viking made this red swan in the 1950's. It is 7.5" long and about 3.5" narrow. In mint condition. (Smaller version of the 11.5" one). New Martinsville / Viking made this red swan in the 1950's. It is 11.5" long and about 5" narrow. In mint condition. 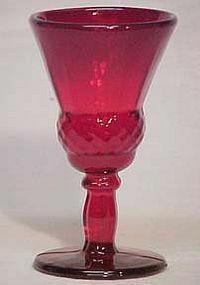 These red wines, sold individually, are from the decanter set known as "No. 15". It never had a name. Wines hold about 3.5 oz. Made by the New Martinsville Co. in the 1950's. 5 are available.